PINFA: In 2009 and 2010, the Phosphorus, Inorganic & Nitrogen Flame Retardants Association (pinfa) organised workshops on “Green Electronics & Innovative Flame Retardants” for the E&E value chain in Brussels,Belgium. The objective of the workshops was to begin a constructive network where manufacturers ofalternative flame retardant technologies could interact with direct users along the supply chain as well asother stakeholders such as regulators and environmental groups. These workshops made a big steptowards fostering mutual understanding along the supply chain on the differen needs and drivers and identified the key issues for flame retardants: how to approach the future of flame retardancy and how to improve the communication throughout the supply chain. Pinfa would like to invite you to its 3 rd E&E Workshop. The idea of having this workshop in Asia is to go tothe manufacturing hub of electronics in order to discuss technology, needs and trends with key players. In addition, an update on developments in Europe and America will be presented. The day will provide attendees with the opportunity to debate key questions on flame retardants with representatives from manufacturers of flame retardants, compounders, electronic manufacturers, regulators, environmental groups and electronics associations. ScienceNews: Materials scientists in Texas have developed flexible coatings mere billionths of a meter thick that keep cotton clothing from going up in flames and plastic foam from melting. Unlike the widely used but potentially toxic flame retardants they’ve been designed to replace, these nano-coatings appear relatively safe, their designers say. Grunlan’s team has been seeking safer alternatives to brominated fire retardants, some of which have been banned over concerns about their potential toxic effects. The researchers’ initial prototypes consisted of alternating layers of garden variety clay and a commercial polymer. But the polymer, a synthetic chemical, did not rely on renewable, green constituents. 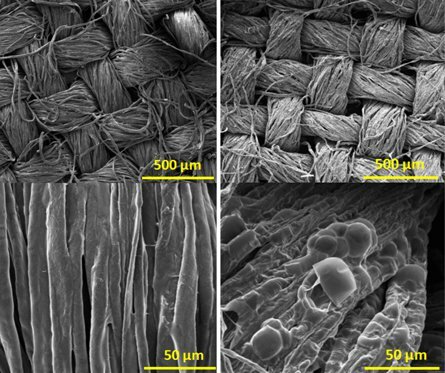 So the engineers swapped it out for an inexpensive waste material: chitosan, a natural compound extracted from shrimp and lobster shells. Like the earlier clay-based recipes the group had worked with, the new formulation proved disappointing on cotton fabric, Grunlan says. But it was a game changer for plastic foam, such as the type used as cushioning in furniture. Untreated foam held over a propane torch flame for 10 seconds quickly ignited, melted and burned up. But after applying 10 dual layers of clay and chitosan to an identical piece of foam, the 10-second flame created a thin veneer of char but left the interior unscathed. Still intent on finding fabric protectants, the team turned to materials that intumesce — undergo a foaming chemical reaction — at high temperatures. In the construction industry, millimeter-thick intumescent coatings on steel girders protect a skyscraper’s skeleton. Grunlan’s group scaled the technology down to nanometer-thick alternating layers of the compounds, polysodium phosphate and poly-allylamine. When cotton fabric treated with 10 alternating layers of each chemical was exposed to a flame for 10 seconds, the fabric charred but didn’t burn up, Grunlan says. The only sign of damage was localized, minor charring where the flame touched the fabric. Li, Grunlan and colleagues published details of these experiments online July 29 in Advanced Materials. These data “sound really good,” Wilkie says — if the concern is preventing ignition of flammable materials. But in the real world, fires last considerably longer than 10 seconds, he points out, so these materials might retard burning or limit its spread, but wouldn’t withstand an inferno. Vince Baranauskas of NanoSonic Inc. in Pembroke, Va., a firm that engineers materials including fire retardants, cautions that nano-layered flame retardants may not be feasible on a commercial scale. “Alternating dips would cost a great deal more than the fabric itself,” he says.